Hey Everyone :) Here are the changes we made to the servers in February! Rewritten server loading and chunk pre-generation. Now all servers load in about 20 seconds. Transferred website and Minecraft servers to a new dedicated server. Changed the way worlds are being handled in UHC-Core. Now it will efficiently remove the world directories during startup/server close. Fixed an issue that prevented an uhc game server to stop after the /start command has been used and everyone has left the game before the countdown has been reached. The force game start now gets removed if all players leave the game during the countdown. Fixed an issue that caused some players with bad connection to be kicked with a "You are sending too many packets!" message. Added /lowspec command in the hub. This helps those players who have FPS issues in the hub. Use it to toggle the lowspec mode. Elements of the hub like armor stands, paintings, item frames and animals will not be shown. Staff that is vanished when a game starts will be automatically killed to avoid being afk vanished in a game. Disabled giving coins when playing. Players weren't actually getting the coins, but a message was telling them so. Added GodUHC Teams of 2 and Teams of 4 servers. Added experimental game mode "Meetup (combat update) - Solo" with the Minecraft 1.9 “combat update”. It requires Minecraft version 1.9.4 or greater. Removed "Flower Power To8 - 2" and "Cake Power - To4"
Added a team bar to Red vs Blue. The bar displays the team you are on and shows the balance between the players in the two team. The more the bar is filled, the more players in your team are alive compared to the enemy team. Reworked the way voted scenarios are counted and sorted in Scenarios Madness. Now it shows the total votes and the votes for each scenario. Added the “Bonus Scenario” to Scenario Madness. A 4th scenario is added randomly. Fixed an issue that caused the scoreboard to not show some of the lines properly in Scenario Madness. Game selector now shows Flower Power To8 on the Flower Power tooltip. The following limitations have been added to the spectator mode: In team games, if there is at least one of your teammates alive, you will not be able to teleport to other players, and you will have to be within 100 blocks radius from a team mate, otherwise you'll get teleported to a teammate automatically. This is not applied during meetup (deathmatch). If your team gets defeated, you will be able to spectate everyone once again. In case nobody voted any scenario in Scenario Madness, 3 scenarios will be picked randomly. Added a "Bonus Scenario" that will be picked completely randomly. This means that Scenario Madness will have 4 scenarios instead of 3. There is now only 1 sign per each game mode. When clicked it shows a team size selection menu and also shows the number of players queued regardless of team size. It has been a very busy month! The ownership transfer was not an easy task. ToastyNetworks is a registered company, and you can only imagine how much difficult has been for me to handle all the "legal" stuff connected with opening a business. There was a lot of paperwork, there was a lot to learn on how to properly handle this. As you may not know, I'm Italian and, apparently, Italian businesses have more tasks to do than most other countries to run a business. With the ownership change, we also had to replace our machines with completely new one. Although ToastyNetworks has already moved to the new machines, PlayUHC will be done next week, probably on Monday (more about this will be announced on Discord #announcements). Now, let’s take a look at the changelog, followed by the new monthly challenge details for the month of February and what to expect in the next months! Fixed an issue that prevented muted players from using /helpop, /report and /ticket commands. Players who abuse the ticket system (/report, /helpop, or /ticket) will get banned. Fixed several issues with the website/forum to make it compatible with PHP 7. This month we will be introducing a brand new monthly challenge! This is most “PvP Points”. You will only be able to earn up to 20 PvP points per player, per game. This means that once you have dealt 20 damage (10 hearts) to a player, you will no longer gain from damaging them. You get PvP points only while playing on these game modes: SpeedUHC, GodUHC, Gone Fishing, Dragon Rush, Flower Power, Scenario Madness. New Hub: it will be up very soon! Reddit UHCs: a new system that handles Reddit UHCs is currently work in progress and will probably be completed within 2 weeks! New Scenarios: after the Reddit UHC new system has been completed, I will work in making few new scenarios taken from your suggestions! New game mode: this will take way more time, but we are working on it! Here are all the changes that happened during December 2018! New plugin “RunOnPortalTeleport”: This plugin will make it so using the nether portals at the Hub will queue them for the correct queue. Countdown will stop counting down if there aren't at least 2 players online, preventing the game from starting with 1 or no players when the server start is being forced. When the game ends, it will now properly send players back to the hub and will keep trying sending players to the hub until the server is empty. This should prevent disconnections that happen when there are a lot of players on the server. Applied several changes to UltraCosmetics to avoid it severely affecting hub performances with infinite console log spam. Created and added ServersManager. This plugin allows dynamically adding and removing servers from our proxy without the need of a proxy restart. This will let us add or remove servers on the fly, and in the future there will be a totally automated game instance manager that will add new game instances when needed. Added a default 5 seconds damage invulnerability during the player teleportation phase at game start and for 5 more seconds after everyone has been teleported to reduce the risk of dying just after being teleported. 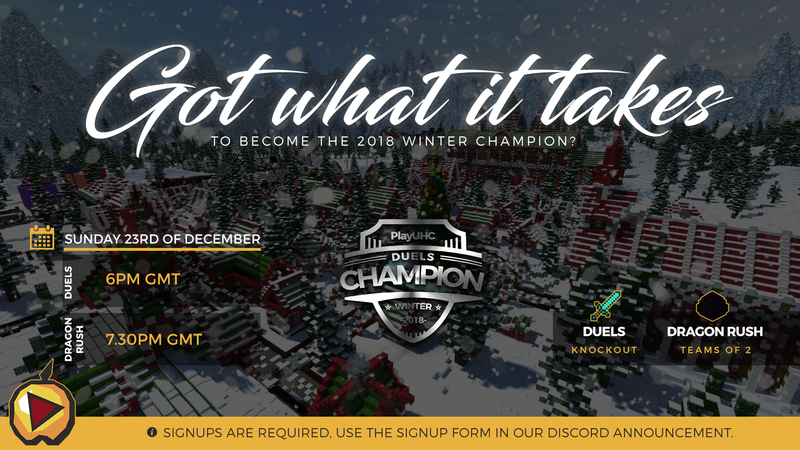 We are proud to present our 2018 Winter Event ! Event will start Sunday 23rd of December at 6PM GMT. We will start with a Duels tournament followed by a teams of 2 Dragon Rush competition. The format of the duels tournament will be made available right before the event starts ( depending on the amount of signups ). The whole event will also be livestreamed with commentary on Twitch , if you are recording your own POV of the event, let us know so we can advertise you or add your video after the event.